Bluewater Ultra-Light Long Sleeve Performance - White Marlin Release Flags. Vintage performance shirts are print on demand (POD) - please allow 3-5 business days for shipping. 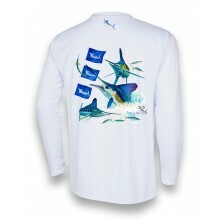 Unisex Solar Performance Long Sleeve offers superior sun protection and performance qualities. Featuring UPF 50 solar protection, the Solar Performance Long Sleeve is lightweight, comfortable, and sure to keep the sun’s rays from penetrating through to your skin. This fabric is powered by PURE-tech™ moisture wicking technology. Manufactured with PURE-tech™ permanent moisture wicking technology. The PURE-tech™ permanent moisture wicking technology is interwoven into the fibers of these highly technical performance fabrics. Unlike standard topical applications, the interwoven system of PURE-tech™ does not fade or wash away with time, it remains strong throughout the lifespan of the garment. Rick Bogert (Bogey) Solar Performance line is ideal for all outdoor activities, water sports, team sports, workouts at the gym, and any high endurance activity.